Something that all students should be thinking about, at any stage in your academic career, is a job or maybe an internship that provides you with job experience relevant to your field of study. At RBC, we understand just how difficult that can be and launched the RBC Career Launch program to help recent graduates get a sense of just what a career at RBC would be like for them. 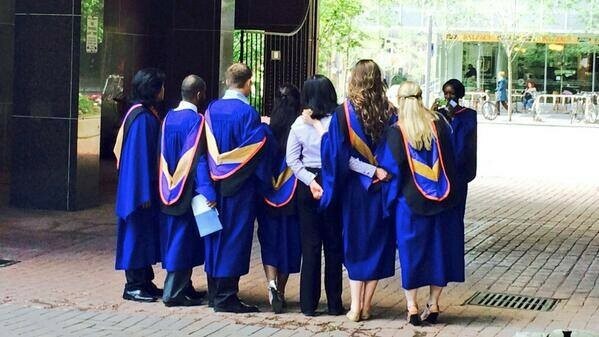 A former RBC Career Launch Associate, Niha Agha, explains the path she took to get there, in the following blog. A Guest Blog from Niha Agha from RBC’s Career Launch program. Graduating is scary. The uncertainty of success is scary. Being a “grown-up” is scary. These are all thoughts that were running through my head while I was getting ready to go up on stage to receive my diploma. I had completed my four years at University… Now what? Everything in university was so structured. There were goals and projects and routines; essentially, I had clear targets and a schedule by which to structure my life. Your degree might teach you the skills you need for a workplace or career field, but it doesn’t necessarily show you how to get there. I came out of school working full time for the same employer I worked part-time for during school, which was great because I felt financially secure. However, I was still looking to start earning some returns off of the investment that I had just made in my Political Science degree. Like all of you, I also went through the same long, tedious process of finding a job. The first step for me was to come to terms with the fact that looking for a job was a full-time job on its own. You need to be 110% committed to it. Whenever I had a day off from my actual full-time job, I would use it to apply for jobs. I used every career-finding website you can think of – Monster.ca, Workopolis, LinkedIn, and even Kijiji. Every resume and cover letter I sent out was specifically tailored to each job posting. I applied to over 50 jobs in 1 month, some of which I was underqualified for (or so I presumed from the many generic rejection emails I’d received) and some of which I was most definitely over-qualified for, but from whom I still got no response. I also did a lot of networking during this time. I asked my existing network to introduce me to their contacts, and then I asked those contacts to refer me to their contacts, and so on. Unfortunately, employers are hesitant to hire people with little experience, and I found myself in a Catch 22 – No Experience, No Job; No Job, No Experience. This is where the Career Launch Program came in. As a recent graduate with little-to-no experience, the Career Launch Program lets you apply your talent and ambition to gain valuable experience in an environment that enables you to realize your full potential. It’s a great way to kick-start your career and network with seasoned professionals. The Career Launch Program taught me so many things. I learned to deal with so many different types of people, customers as well as managers. My verbal and written communication skills improved vastly, and I learned how to deal with difficult situations, manage different projects, prioritizing my time. Most of all, I’ve gained valuable work experience from a renowned Canadian institution. My advice to all those experiencing a frustrating job search: Don’t get discouraged! Take the opportunity to learn from the rejections, and reflect on those moments. A job isn’t just going to fall into your lap, but your persistence will pay off eventually. Click here to read more blogs in the RU Money Smart Series. Check out Ryerson’s Career Centre for opportunities to attend events and workshops that can help you on your career journey. Also take a look at Magnet, a program Ryerson’s Career Centre is partnered with and which works to connect you with the opportunity you’re looking for. Share your career tips with us @RUStudentLife!